'Goodwin Place', the estate of Philip Lippincott Goodwin designed by himself c. 1917 in Woodbury. Goodwin was a partner in the architectural firm of Goodwin, Bullard & Woolsey and at one time vice chairman of the Museum of Modern Art in NYC. Click HERE for more on 'Goodwin Place'. The house has since been demolished. 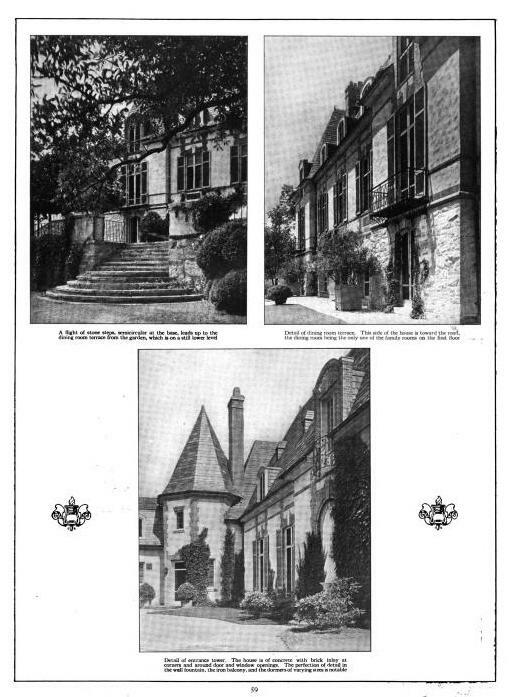 Photos from Country Life, 1921. Horace Trumbauer, who employed him for the presentation drawings that would assure American palace builders that they had become princes. Guerin was famous for his peculiar night blue backgrounds ~ still, quiet and timeless. Appropriate to noon or midnight ~ that gave to the dream palaces he rendered a dramatic ambience. Old Gray Dog, or anyone else -- is the Jules Guerin mural over the dining room fireplace (the buildings on the hill) now at the Musuem or Modern Art or somewhere else on display? I've seen that before. What a fabulous house this was. I love the dining room murals, the hand-hewn beams in the great living room reused from an old barn on the property, the tile floors, and the innovative way the house was built just off the crest of the hill. 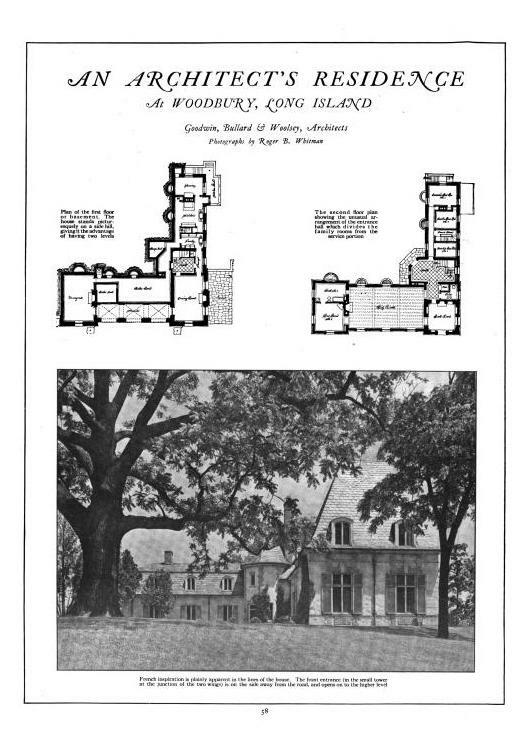 Along with architect Henry Killam Murphy, Goodwin authored the influential 1924 book FRENCH PROVINCIAL ARCHITECTURE. I recently showed some examples on my blog of both architect's work in the Villages of Coral Gables, Florida. Goodwin designed some delightful French Provincial style houses and Murphy, in the Chinese style! Guerin did many paintings of the Chateaux of Touraine, and Chateaux of Val-de-Loire. The one, over the fireplace at Goodwin Place, looks like one of the his versions of Chateau Chinon. This Old Dog's guess is that the Goodwin Place murals were lost in the fire and demolition of the Goodwin house, alas !!! Such a really marvelous place. What more can I say? 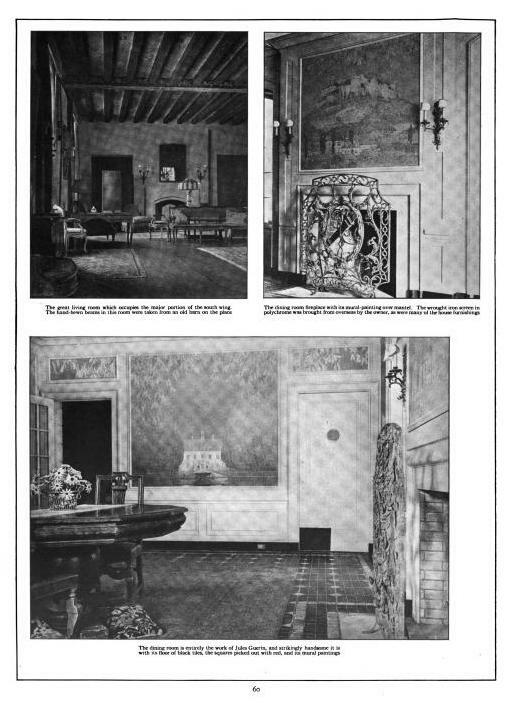 Doug, the mural over the fireplace bears a more than passing resemblance to murals in the ballroom at Filoli in Woodside, California. Could this be what jogs you? 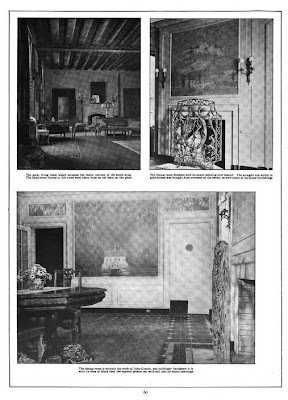 Thanks OGD & DED; I didn't see the Goodwin house before it was lost & I've never personally seen Filoli in California but I have a [obviously partial] memory of standing & looking at that painting -- probably another version by Guerin somewhere else. I'm sure I'll remember in a month while stopped at a traffic light.